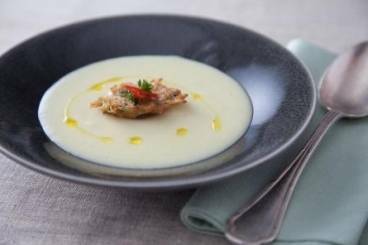 Rich and fresh herby potato soup with a lightly spiced crab fritter. Peel and finely dice the shallots and garlic. Peel and cube the potatoes. Pick the parsley form its stalks and finely chop the leaves. Heat a suacepan over a medium heat and sweat the shallots in the butter with the garlic and some of the parsley stalks and thyme. Add the potatoes, season with salt and then add the stock. Bring to the boil, reduce to a simmer and cook until the potatoes are soft. Add some of the chopped parsley and blend the soup in a food processor with a little cream until smooth. Season to taste. Pick through the crab to remove any shell or cartilage. Finely dice the chilli. Peel and finely chop the garlic. Pick the flat parsley and roughly chop the leaves. Zest the lemon. Mix the flour and eggs together with a whisk. Add the crab, chili, lemon zest and garlic. Season well and add water if the consistency needs adjusting. Heat a frying pan until hot and add the sunflower oil. Shallow fry the crab cakes until golden brown and cooked through. Pour the soup into a bowl. Place a fritter neatly in the centre of the bowl and garnish with curly parsley.